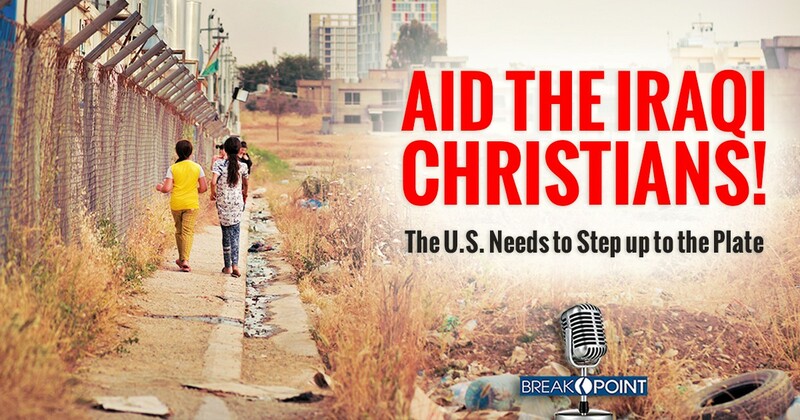 BreakPoint: Aid the Iraqi Christians! For too long the U.S. government has done too little to aid Iraqi Christians. That has to change. It takes courage to be a Christian in Iraq, more courage than I or I’d bet most of us can even imagine. Some of the courage we see from our brothers and sisters there comes from the church’s deep roots in the region. Tradition holds that the Gospel was first preached in what is now Iraq by Thaddeus, who was either the Apostle of the same name or one of Jesus’ seventy other disciples mentioned in Luke 10. By the end of the first century, when most of our ancestors were still worshipping trees, the Aramaic-speaking people of what is now northern Iraq worshipped the Triune God. Their faith has survived for generations, including through the coming of Islam and the Mongol hordes. But it might not survive American faithlessness. At the time it was a welcome announcement. That’s because little, if any, of the $1.4 billion in U. S. humanitarian aid distributed by the U.N. actually reached Iraqi Christians. Unfortunately, as former Reagan National Security Advisor Robert McFarlane and Representative Chris Smith recently wrote in the Wall Street Journal, seven months later those communities still haven’t received the promised support from USAID. In fact, last month two requests for support from the Nineveh Reconstruction Committee and the Catholic University in Erbil were rejected without explanation. In their article, McFarlane and Smith ask, “Where is the direct aid Mr. Pence promised?” They warn that “the light of Iraqi Christianity could be permanently extinguished” if the U.S. doesn’t keep faith with Iraqi Christians. That same day, an even blunter assessment was published at National Review. Benedict Kiely of Nasarean.org wrote that Middle Eastern Christians, especially Iraqi ones, no longer consider the United States to be a serious ally. This is an important step to right what’s become a 15-year wrong. Since the invasion of Iraq in 2003, Iraqi Christians have been, at best, an afterthought in the minds of American policymakers. They failed to provide for their security when Saddam Hussein was deposed, and more recently, the United States failed to recognize the threat by ISIS posed against Iraq’s Christians. It took until March 2016 to use the word “genocide” in this context. If we can’t do this much, then calling us “unreliable” would be putting the matter charitably. As John reiterates, the situation with Iraqi Christians must change, and the United States has the ability and the strength to give the aid needed. Pray for our leaders and organizations to get rid of roadblocks and get the job done. For more discussion on this topic, check out the links in our Resources section.